Well it turns out today’s what’s making me happy was easy. 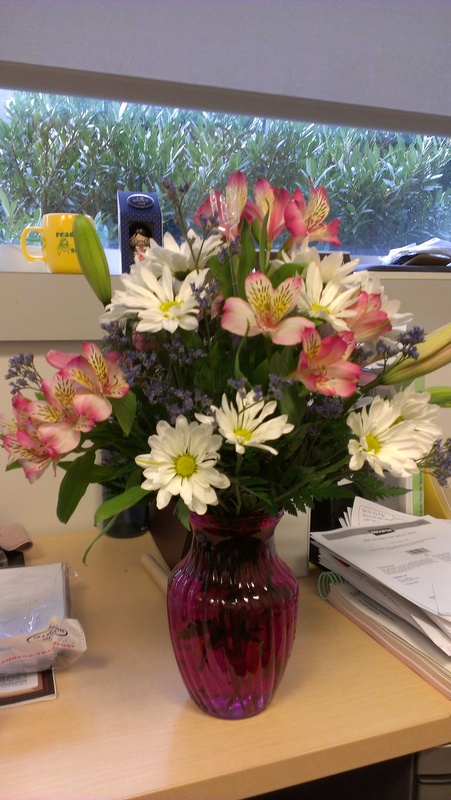 My husband sent me flowers at work. At least I think it was my husband since there was no card attached saying who they were from. They are from the local flower shop in our neighborhood though, and since I’m not aware of having any secret admirers I’m pretty sure they’re from him. I think he was just trying to make sure that he was the feature of one of these posts. What do you think? Or he’s going for best husband award since the last few weeks it’s been talked about on twitter. Ha! I hadn’t thought about that. Probably.